Brisas was absolutely beautiful. The staff are beyond accommodating, taking the time to show us around and offering consistent kindness over the course of our stay. The apartments are beautiful and have a lot of personality. I wouldn't change a thing. I cannot say enough good things about this wonderful place and it's hosts! Great place to stay. Clean, quiet, and a 15 minute walk to all kinds of food options. The beach is about a 20 minute walk. The hosts were very friendly people. There were several beach items we could use which was a bonus. My daughter and I loved our stay at Brisas! I was surprised to find that there was a cleaning service that came in Mon., Wed., and Fri. to clean the apartment, replace towels, change sheets etc. We would definitely stay here again and highly recommend it for others. Marlon and Freddie were fantastic hosts! The apartment was great and the beaches wonderful! We loved our rooms and the courtyard outside. Very good A/C. Everything was very clean and the host and other staff were very welcoming and friendly. All of our needs for time at the beach (chairs, towels, snorkel and mask) were waiting for us. Also, very easy to get to most of what we wanted to see and do on the island. The apartment was super cute, "adorable" as my wife claimed. The outside sitting area was fantastic and great restaurants within walking distance. The warm water showers were great, very relaxing after a long day in the sun. There is AC in the bedroom and in the living room. We didn't cook in the apt. but if we wanted to, everything is there. The towels in the bathroom were nice and soft. Thanks for the beach towels and the ironing board. We travel a lot, all over the world. We often stay in hotels or condo's. Brisas is great. We especially enjoyed the patio; we sat there till late at night in the nice Aruba breeze. We both felt secure and safe at Brisas. Brisas is close to the hotel area, yet quiet and private. Parking was great too, just like at home. A special thanks to the owners, nice folks! Love that it was cozy and I felt like I was right at home. So close to the beach, that was a huge plus. The owner, Freddy, was so helpful and so kind. We will definitely be staying here when we go back to Aruba. Lock in a great price for Brisas Studio Apartments – rated 9.5 by recent guests! Brisas offers fully equipped apartments located a 10-minute walk from the restaurants, bars and shopping centers of Palm Beach, Aruba. The property has a garden, outdoor BBQ facilities, free Wi-Fi and on-site parking. 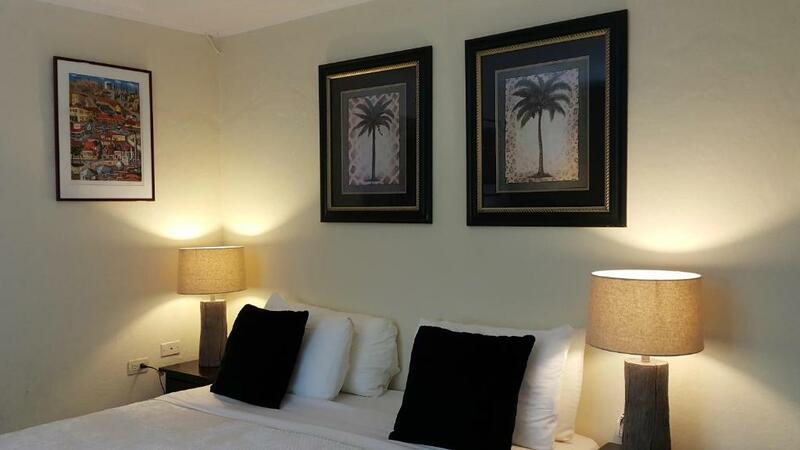 The Brisas apartments feature bright, tropical-style décor and private terraces. They have air conditioning, a seating area and a fully equipped kitchen with a stove, oven and fridge. Some of the island's most beautiful beaches are available within 0.6 mi, and the capital city of Oranjestad is just 5 mi away. Tierra del Sol Golf Course is within a 5-minute drive, while Queen Beatrix International Airport is 6.2 mi away. Airport pick-up and drop-off service is available on request. 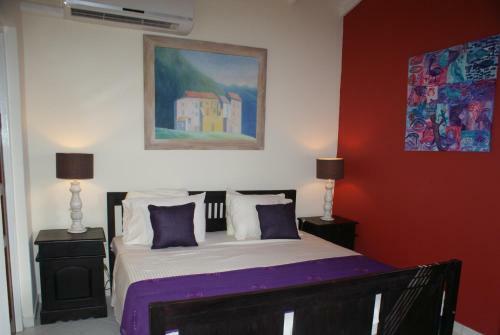 When would you like to stay at Brisas Studio Apartments? Offering a terrace with garden views, this air-conditioned apartment features a seating area, a fully equipped kitchen and a flat-screen cable TV. It has a safety-deposit box, a blow dryer, an iron and an ironing board. The bathroom includes free toiletries, and house keeping is provided 3 days a week. Beach towels are also available. 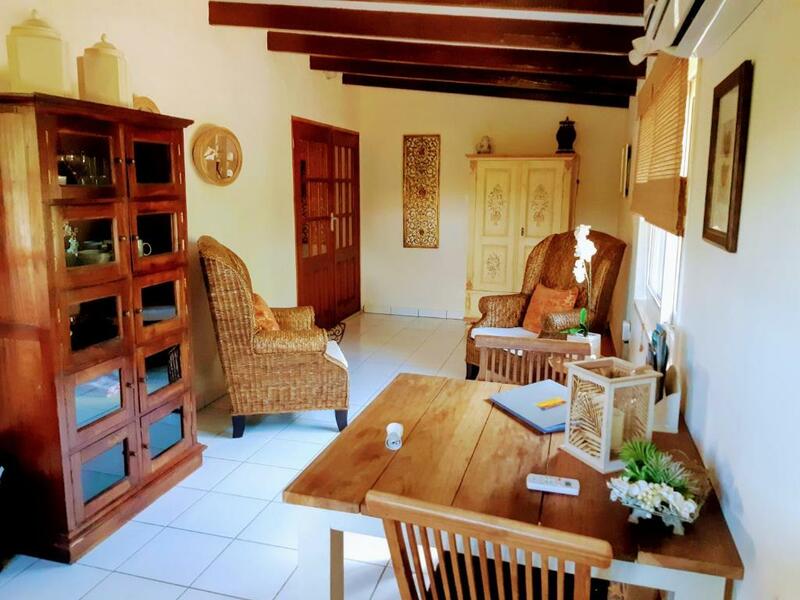 Brisas is a charming small scale accommodation offering 4 self catering studio apartments, located in the middle of a quiet local residential area in Palm Beach. 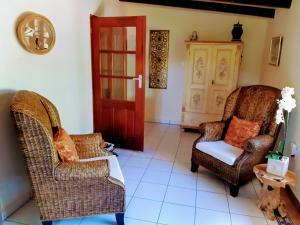 Make yourself at home in one of our 4 comfortable self catering studio-apartments. These air-conditioned studio-apartments can easily accommodate 2 guests and offer a fully equipped kitchen, a private bathroom and a terrace overlooking the garden. Our studio-apartments offers also free internet (Wi-Fi connection), flat screen TV, safe, coffee maker, water cooker, toaster, blow dryer, iron and iron board. Free of charge are also available beach towels, folding beach chairs, cool boxes, snorkel gear sets and barbecue grills. Our guests can make free use of some beach facilities (lounge chairs) at Palm Beach. 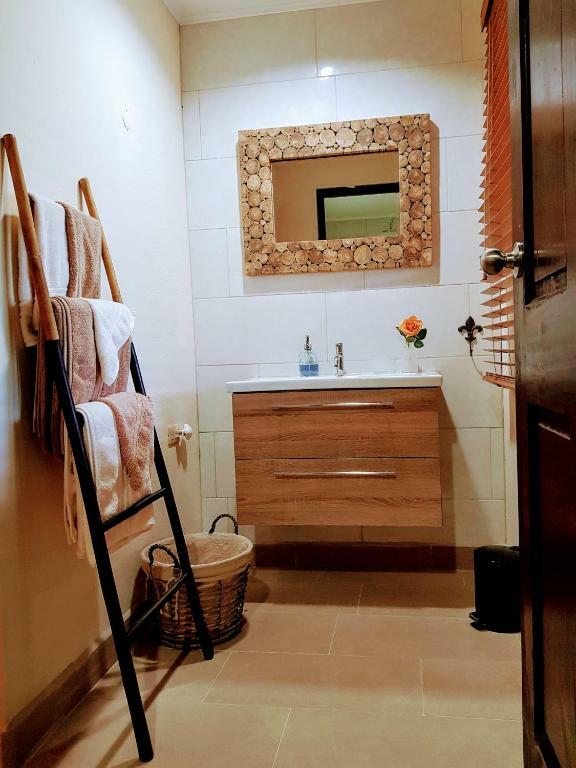 Housekeeping is provided on a three days a week basis.The interior is cozy furnished, tastefully decorated and fully functional equipped for your comfort. The accommodation is all fenced in and there are free parking spaces. 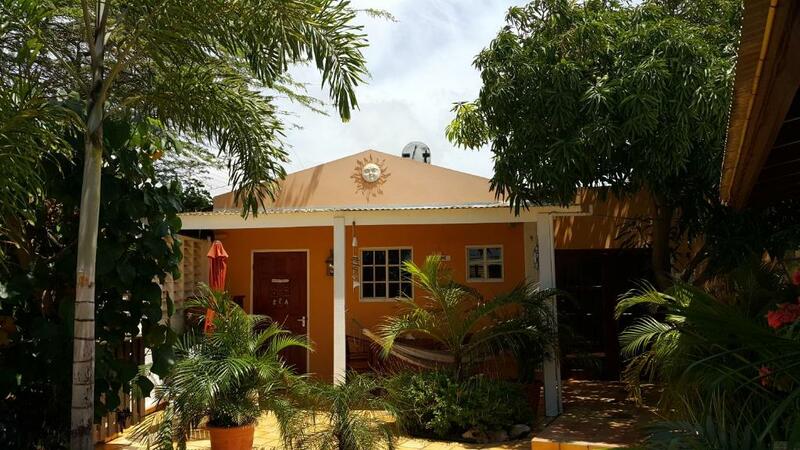 Brisas is an affordable, friendly and quiet place to stay. We will be more than happy to welcome you to our beautiful Island and will see to it that you will feel at home at Brisas. With a stay at Brisas Studio-apartments in Palm Beach at Aruba, you’ll be near our worldwide famous beaches and minutes away from supermarkets, laundries, shopping centers, bars, restaurants, cinemas and other entertainment. The turquoise waters of the Caribbean Sea and Aruba’s bright white sandy beaches are perfect for everybody to relax under a palm tree or palapa and invite you to swim, snorkel and dive or to do many other water sports like sailing, skiing, surfing and kiting or why not jump on a boat for a guided tour? If you want to do something different, golf courses, horseback riding facilities, bowling alleys, tennis and beach tennis courts are also only minutes away. Whenever you would like to explore the Island, Brisas staff is there to assist you. They’ll help you get your rental car, book your trips, get you a bike and get you the bus timetables. Starting points of various tours and excursions and the bus stops are at 10 minutes walking distance. You will surely have a great time. House Rules Brisas Studio Apartments takes special requests – add in the next step! 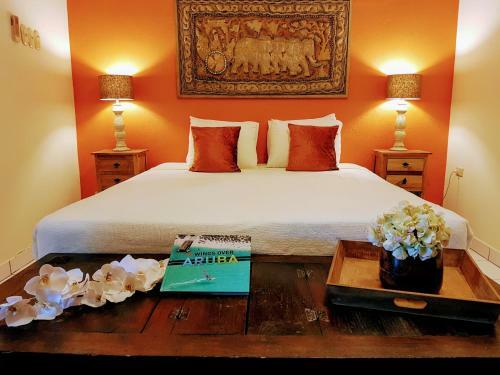 Any additional adults are charged USD 35 per night for extra beds. Brisas Studio Apartments accepts these cards and reserves the right to temporarily hold an amount prior to arrival. Please inform Brisas Studio Apartments of your expected arrival time in advance. You can use the Special Requests box when booking, or contact the property directly using the contact details in your confirmation. It was a little bit of a hike to the beaches if you don't have a car. Suggestion to rent bikes for the week if you don't have access to a vehicle but not necessary if you like walking. Brisas is absolutely a gem. The studio is very nice, everything you need is in place, both inside and outside. It is close to the beach and the Arubus and it has the advantage to be located in a quiet area. The owners are very kind and helped me with all my questions. If you go for business or for vacation to Aruba, in both cases this is a very nice place to stay. The only negative was that there are dogs that live on the street and are not on leashes. I am afraid of dogs and ended up renting a car even though the beach, restaurants, and other points of interest are within walking distance. 1.Difficult to find the address, but it’s not the owner’s fault. There are no street signs anywhere on the island. At one point, we called the owner who came and picked us up. Suggestion: maybe attach a little map on-line with additional info to help one find the place. 2.The bed (and pillows) too hard for me. The garden is beautiful and the apartment very clean. The host, Freddy, is super nice. The location is 5 min by car from the beach. One does need a car, but the apartment area is so quiet and parking spots are plenty at the beach. We would definitely stay here again. We were picked up at the airport by a private shuttle arranged by the owners. When we arrived we were met by a very lovely lady, Marlon. She gave us the keys and showed us around. She also stopped by a few other times, just to see if we needed anything. The unit was very clean and the kitchen was well equipped for our needs. The Brisas is a nice walk to Palm Beach, but after 3 days we decided to rent a car for the rest of our month stay. The owners provide beach chairs, beach towels, and a small cooler to take to the beach. There is a laundry facility close by called Drop and Wash. I used their service 3 times. They did a great job. The Super Foods grocery is about a mile away. Go early if you can. It is a nice grocery store, but it’s CRAZY busy, There is also a small grocery called Unicasa that we shopped at a few times. I would definitely recommend The Brisas to anyone looking for a relaxing vacation. You would be hard pressed to find owners any nicer than Freddie and Conny. They live there. If you need anything you can call, text or email them. They went over the top to accommodate us. It’s a wonderful place! The Brisas apartment C- is very new or newly renovated- sparkly clean with furniture with old antique feeling that creates a nice atmosphere. There are all necessary utensils and pots and pans if you into cooking on your vacations. The patio is lovely to have a breakfast in the morning or late night drink- just be prepared with mosquitos spray. :-) The palm and mango trees creates such a wonderful atmosphere. A car is necessary as getting back to apt late in the night was not exiting for me:-)- the roads does not have a banquets and because of it - it is not safe walking. The apt is very close to Palm and to Eagle Beach. The owner Freddy is always available to answer questions- you just send email and he is popping up in 5 mins :-). We loved the apartments and a new one was just added.